For me, after crafting reading about crafting is the next best thing. I love reading about new techniques, even if I am quite unlikely to actually use them any time soon (if ever). Considering I rarely embroider, for example, I have an awful lot of books about embroidery techniques. Black work, white work, hardander, crewel work, all those amazing traditional techniques that take a lot of time and patience, but look just beautiful, techniques that I just might one day have a go at. Or not, who knows. Meanwhile, I just love browsing them and getting inspiration from them. For a while now I have been thinking I’d like to learn to make images using a textile technique of some sort. I have a lot of photographs that I’d like to reinterpret in a textile format, perhaps as a tapestry or needlework (so maybe all those embroidery books will come handy one day). As the readers of this blog will now, I have done a lot of dyeing this year, and it would be nice to be able to use all those colours in techniques beyond knitting. 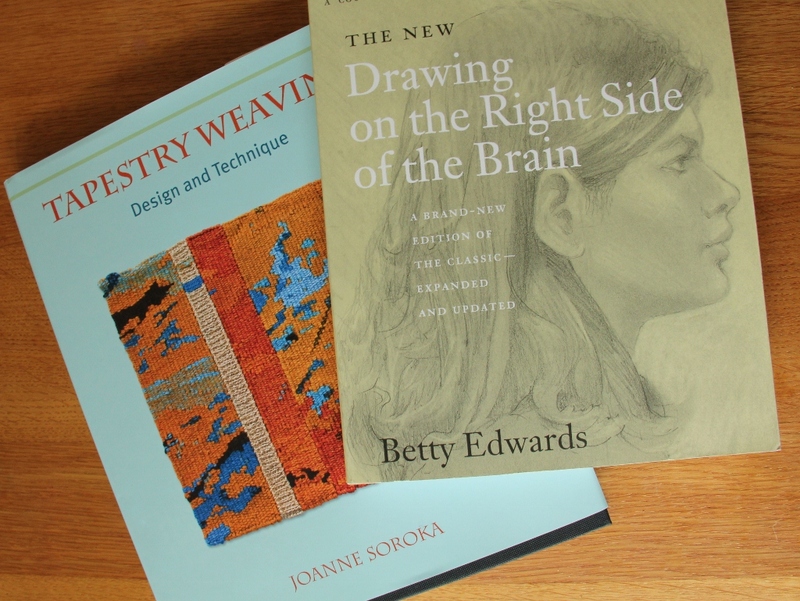 For inspiration, I have been reading Joanne Soroka’s book Tapestry Weaving: Design and Technique. It is a very good book on the topic, I definitely recommend it for anyone interested in textiles. It provides enough guidance on the technique for a complete novice to get started, but it also provides plenty of images of historical and modern tapestries for inspiration. It does not contain instructions for any specific projects, but guides you through the process of designing your own tapestries. On the practical side, I was particularly happy to see that it is remarkably easy to make a weaving frame if you have a couple of pieces of wood, a hammer and a few nails so you don’t need to buy expensive equipment to get started. You can even use a sturdy picture frame. And the technique itself is pretty simple (at least in theory), so it is entirely feasible to just have a go. So all in all, tapestry weaving is one of those techniques that I can actually see myself trying at some point, perhaps even quite soon. But there’s another thing I think I will need to do first though. And that’s learn to draw. Like most people, I used to draw as a child and a teenager, but as an adult the skill has got forgotten. Now I am almost scared of even trying. But I found another book that I hope will help me get over this hurdle: Betty Edwards’ Drawing on the Right Side of the Brain. It is a real classic on the subject of learning to draw, but just for the benefit of those not familiar with it Betty Edwards argues anyone who is able to hold a pen and write is also able to learn to draw. And not just draw child-like stick people but actually draw realistic images. Drawing as a perfectly teachable and learnable skill is definitely a comforting premise for such a book. So far I have only read through the introductory chapters, which make a very interesting read on their own right for anyone interested in learning about how the brain functions. The main thing you need to learn is how to switch your brain into a correct mode that allows you to really see your subject in order to draw it. The book then guides you through learning the main component skills of drawing which are all to do with perception: perception of edges, spaces, relationships, lights and shadows and, finally, the perception of the whole. I might not turn into a Drurer over night, or a master tapestry weaver, it might even take me a little while to get started. Or perhaps something else will capture my enthusiasm before I get round to trying these things. Meanwhile, it has been fun to read, be inspired and dream about what to try next. Categories: Favourite Craft Books | Tags: learning to draw, tapestry weaving | Permalink. 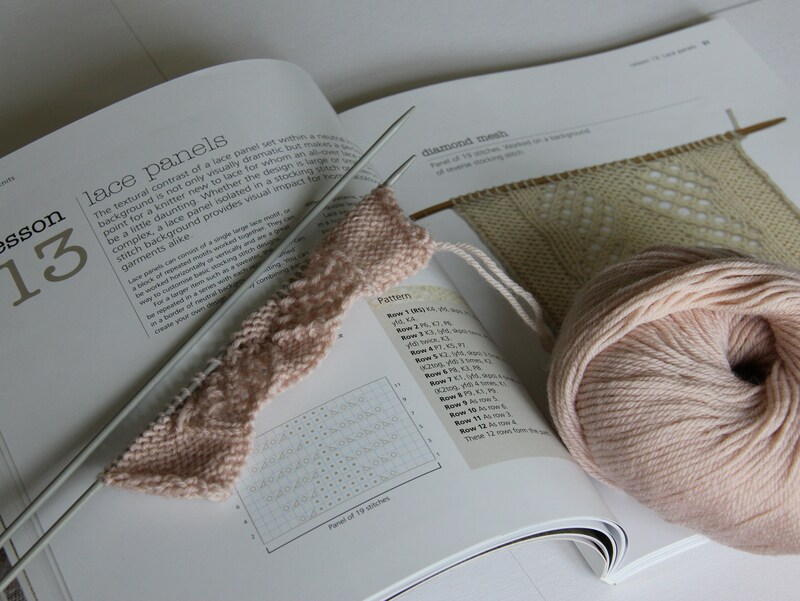 Anyone who reads knitting blogs or browses Ravelry for knitting patterns can’t have failed to notice that lace knitting is incredibly popular at the moment. Ravelry is just full of lovely scarf and shawl patterns and with the availability of so many beautiful lace knitting yarns, you can easily see why everyone seems to be knitting lace. Unfortunately my first attempt at knitting lace a few years ago was a complete disaster. I had purchased Jane Sowerby’s inspiring book Victorian Lace Today and started knitting the easiest pattern in it. It’s not that lace knitting techniques are difficult as such, but I quickly discovered that counting to five, let alone 7, is not my strongest point. I’m pretty absent minded at the best of times, my mind is always so full of thoughts and ideas that between the counts of 3 and 4 it just wanders off, following a particularly interesting train of thought, and my hands would be left on auto-pilot. So inevitably I made countless errors which I did not see a way of being able to fix. As Rowan’s mohair Kidsilk Haze is not the easiest of yarns to unravel, in the end I just had to abandon the project and I haven’t dared to try knitting lace ever since. But recently I have started thinking that if everyone else is able to knit lace, it would be very odd I couldn’t learn it too. Surely Zen Master-like focus and concentration can be learned like any other skill? I’m sure all those Zen masters didn’t just wake up one day and decide that from now on they will be able to master perfect focus instantly. And perhaps I can make it easier for myself by starting small, and knitting with thicker yarn knitted with correct-sized needles. That way I can visually see the pattern more clearly, so that if and when I lose track of what I am meant to be doing I can more easily see where I am. As I am a great believer in “if in doubt, buy a book”, I decided to buy a helpful book on the subject. In the end I chose Lynne Watterson’s Very Easy Lace Knitting , and now I am glad I did. It is a very good book: visually pleasing, clearly laid out and uncluttered, with detailed instructions suitable for the complete beginners. The book is organised around lessons based on sample squares, many of which are very pretty despite being relatively simple. There are some complete projects too, some inevitable baby items and home accessories, a jumper, and a few scarves and shawls. They are nice enough, some of them I could see myself making, but I’d say the main value of the book is in the pattern library. The only complaint I have is that the book does not offer any trouble-shooting advice or tips on how to avoid errors. For example, it does not include the very useful “life-line” technique. But all in all, it’s a great book, just right for someone like me who is trying to learn lace knitting in small steps, before launching into a full blown shawl project. Categories: Favourite Craft Books | Tags: lace knitting, Lynne Watterson, The Very Easy Guide to Lace Knitting, Victorian Lace Today | Permalink. I have always been a real bookworm, I just love reading. And I love having lots and lots of books at home. Given my obsession with crafting, it inevitably follows I can’t resits craft books. It is sad that my local library does not have a very good collection of them, so I have ended up having to buy a lot of books myself. I usually tend to buy books which I can learn useful techniques from, I rarely end up making the actual projects exactly as they appear in the book. I even buy books on techniques I have no immediate intention on actually using – for example, I’ve got lots of books on all types of embroidery, something which I like but as a craft is very much on a back burner at the moment. But a really good craft book of course provides both useful advice and inspiration. There are far too many craft books that are just uninspiring and look dated, but I am so glad in recent years there have been a new surge of craft books that are fresh and modern, look beautiful and are packed with useful tips. It is these books I wanted to start writing about in this blog. 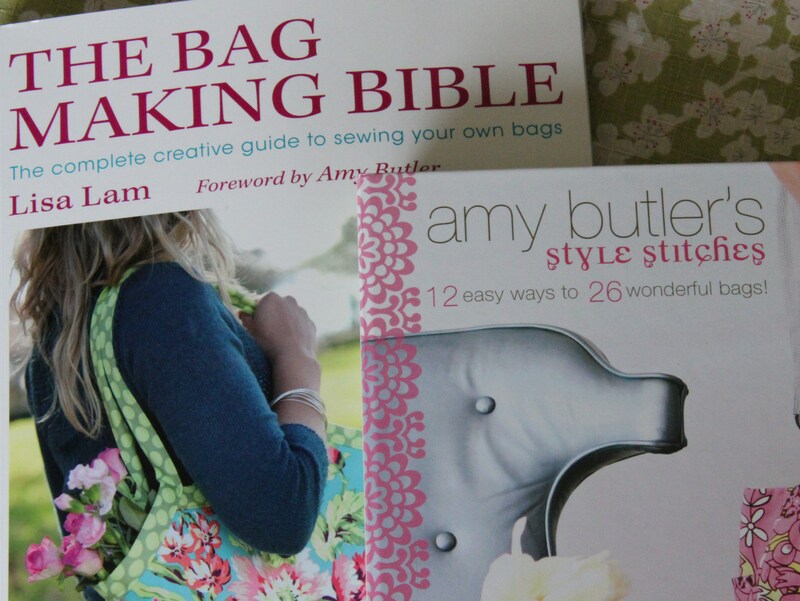 As I have been on a bag making theme recently, what better way to start than covering two great books on that topic. They are Lisa Lam’s The Bag Making Bible and Amy Butler’s Style Stitches: 12 yeasy ways to 26 wonderful bags. Both books show that a girl who loves her handbags really does not have to spend a fortune on wonderful and unique bags, she can easily make her own. But although they both cover the same topic area, these books are quite different and in many ways perfectly complementary. The Bag Making Bible by Lisa Lam is a really practical book that covers all aspects of bag making. Its chapters are organised by technique (such as structure and reinforcement, linings, closures and so on) and each chapter finishes with a project you can practise that technique with. The projects are colourful and modern, often using Amy Butler’s fabrics, so they really are projects that you can easily see yourself actually making. The projects start with an easy book bag and a bucket bag, but quickly move on to more structural bags that I at least would not have been be able to figure out how to make on my own. I particularly love the Great Getaway bag which really looks like a “real/shop-bought” bag (you know what I mean…). If I ever get to that stage in my bag making I really will be very pleased with myself. I have not yet made any actual projects from this book, but I have used some of the techniques in my bags that I have recently made. I particularly like the fact that there are lots of photos illustrating each techniques, and I have found the instructions very clear and easy to follow. So all in all, this really is an excellent craft book, exactly the kind I wish there were more of. Amy Butler’s Style Stitches is an amazingly beautiful book. The photos are gorgeous and the pages are decorated with her designs. If you like Amy Butler’s style, you are going to love this book. If you don’t, well, then it’s not going to be quite as useful as Lisa Lam’s The Bag Making Bible. This is because the book is organised around Amy Butler’s bag designs rather than specific techniques, so the focus is definitely on prettiness rather than on educating the readers about the bag making process and the materials and techniques involved. The projects are ranked according to their level of difficulty. The easy ones consist of everyday shopper-style bags and a set of make-up pouches. It then moves on to the more involving projects such as a pleated clutch, a coin purse and several different types of handbags. So far I have made several make-up pouches (which unfortunately I gave away as gifts before photographing them). Although I did manage to follow the instructions pretty easily, there aren’t any photos guiding the process, only some drawn diagrams. In this respect Lisa Lam’s book is definitely more helpful. If you prefer lots of visual guidance rather than text-based instructions this book might not be for you. That’s not to say the book isn’t well written, it is, and there are some diagrams, but I feel that given the otherwise high standards of photography in this book, they could have provided a few helpful technical photographs. But having said that, those people who love Amy’s style and bag designs will probably buy and love this book anyway. So all in all, these two books are both excellent in their different ways. The Bag Making Bible provides lots of information and advice on technique, as well as many great bag designs that you can easily adjust to make your own. Amy Butler’s book is packed with beautiful and quirky bag designs and gorgeous photography and will without a doubt appeal to her many fans. So if you are bag-lover (and whichever girl wasn’t?! ), then you should definitely have a go at making your own bags – that way you can always have the perfect bag for every occasion. These two fantastic books will guide you through the process. In case you want to buy these books, here are the links to Amazon (please do note that I am an Amazon affiliate, so if you purchase the books through these links I will get a few Amazon reward points). Categories: Favourite Craft Books | Tags: Amy Butler's Style Stitches, bag making, craft book review, Lisa Lam, The Bag Making Bible | Permalink.